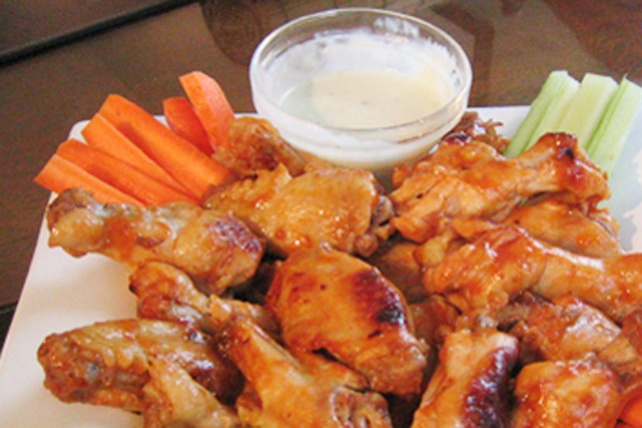 Make these delicious grilled Buffalo wings at home instead of ordering takeout. Always a crowd favourite, these delicious chicken wings, made with just a few simple ingredients, are oh so easy to make. Mix all ingredients except wings until blended. Add to wings in large bowl; mix lightly. Place on large sheet heavy-duty foil; fold to make packet. Grill 40 min. or until wings are done, turning every 10 min. Prepare recipe as directed, using regular Heinz Tomato Ketchup, and substituting 1/4 cup each liquid honey and soy sauce, and 5 minced garlic cloves for the barbecue sauce. Prepare recipe as directed, using regular Heinz Tomato Ketchup, and substituting 1/4 cup each maple syrup and Heinz Yellow Mustard for the barbecue sauce.